This recording was the last of a spurt of G&s recordings issued by various companies between 1906 and 1908. Of all the early acoustical sets it is by far the most important due to the presence of Walter Passmore as Ko-Ko. This set, like all the others of its period, was cast predominantly with stock recording artists who were chosen for their affinity with the gramophone, rather than their G&S backgrounds. Given the conventions of the time, it is remarkable that Odeon went to the trouble to recruit Passmore for the comic lead, instantly elevating the set from a mere curiosity to one of great historical importance. Walter Passmore was the second in a long line of great D'Oyly Carte patter baritones, filling the gap that had remained for about four years after George Grossmith's departure. 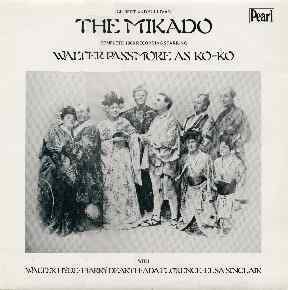 He joined the Company in 1893 for the ill-fated Jane Annie, played Tarara in the original production of Utopia, Limited, and first played Ko-Ko in the 1895-6 revival of The Mikado. In The Grand Duke he was cast as Rudolph, and later roles in the G&S revivals included Jack Point (Yeomen), Don Alhambra (Gondoliers), the Usher (Trial), Wells (Sorcerer), Sir Joseph (Pinafore), the Sergeant of Police (Pirates), Bunthorne (Patience), the Lord Chancellor (Iolanthe), and of course more Ko-Ko's. Passmore is in the select company of performers who recorded a role that they played under Gilbert's and Sullivan's personal direction. As the cast list shows, there is little consistency in the assignment of parts, but that was typical for a recording of this period. The opera is musically complete, aside from the overture, two sections of the Act I finale, and (most curious) "The Sun Whose Rays." The recording was re-issued on LP by Pearl Records (GEM 198). Four tracks of it have been re-issued on CD, as part of the Sir Arthur Sullivan Sesquicentenial Commemorative Issue, Volume 2. Harry Thornton sings Pooh-Bah in "See how the fates" and "The flowers that bloom in the spring." Harry Dearth sings Pooh-Bah on all other sides. Francis says that Thornton sings Pooh-Bah in "Young man despair," but other sources suggest it could be Dearth. Francis also says that Thornton is singing in "Were you not to Ko-Ko plighted," which is clearly erroneous. In column #1 of catalog numbers, those sides marked with a * were replaced with different takes in some later copies of the set, according to Francis.